When I graduated from college, I immediately began looking for a private sector job. I didn’t consider pursuing a government position even though my father and four of my uncles worked for various agencies or departments. Maybe my reluctance was because I saw my father work incredibly long hours and I thought NO WAY! But after 10 years of long hours in a private sector job with little job security, I was back in the job market. This time, I focused on the federal government and was pleased to get hired. After eight years at that job, I was ready for another change. I was fortunate enough to be recruited by the NRC. 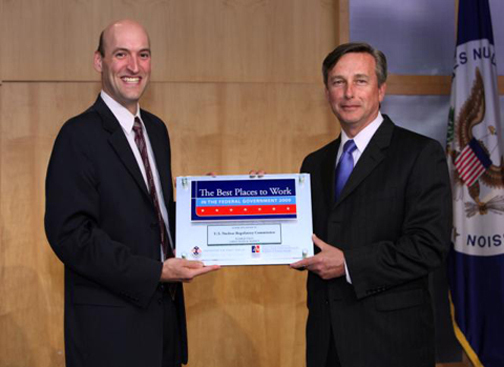 When I started at the NRC it had just been rated The Best Place to Work in the Federal Government for 2007. I soon found out why. The NRC offers great work life benefits with flexible work schedules, telework opportunities, an on-site health care center and even day care for those with children! I didn’t quite understand what being No. 1 meant but here at the NRC it’s taken very seriously. NRC employees are surveyed annually about leadership management, performance, talent management and job satisfaction. If the NRC has a low score in one or more of these areas, the NRC takes measures to improve so that employees know they are being heard. The top leaders at the NRC believe the satisfaction of their employees directly supports the mission of the agency and the ability to meet the public’s expectations. So the efforts are not just for the employees, but for everyone the NRC serves. The NRC must be doing something right. We’ve now been ranked No. 1 for the third time in a row! It’s a great feeling to say you work a the best place in the federal government and know that as an employee, you helped made it happen. Take the same poll in a year’s time and the results will be markedly different if Jaczko continues to allow politics to control NRC decision-making. Next Next post: When Foreign Countries Want to Buy into U.S. Nuclear Power Plants – What Then?